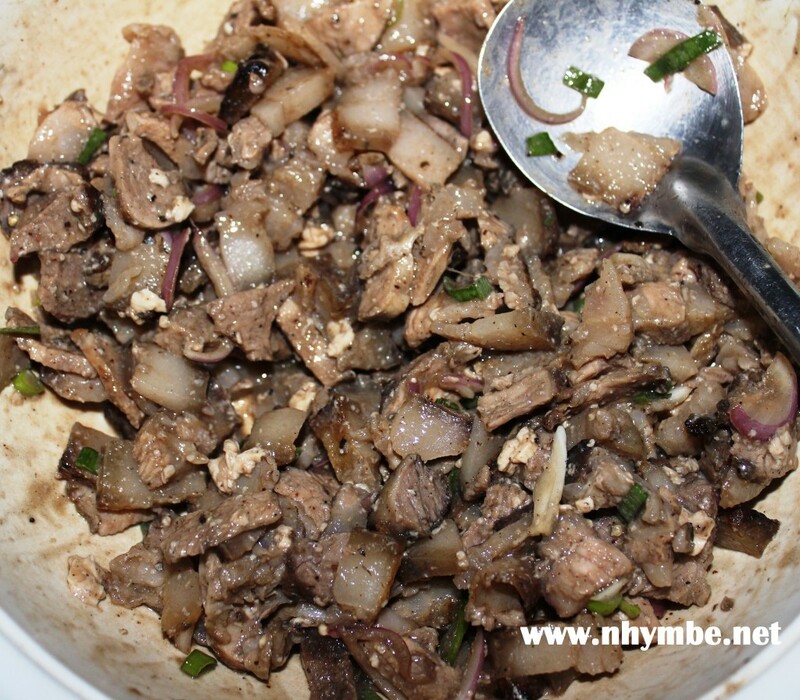 Dinakdakan is one of my favorite pork dishes. It is a comfort food that reminds me of happy, childhood memories because this is one of my mom’s specialties. Dinakdakan is always present in our family’s special lunch or dinner during special occasions. 1) Boil the pork belly or pig ears, liver and pig brain for about 30 minutes or medium tender. Note that the brain should be wrapped securely in an aluminum foil before boiling it together with the pork. Or better yet, steam it separately, it’s up to you. 2) Grill the pork meat and liver for about 5 minutes, flipping them every once in a while. 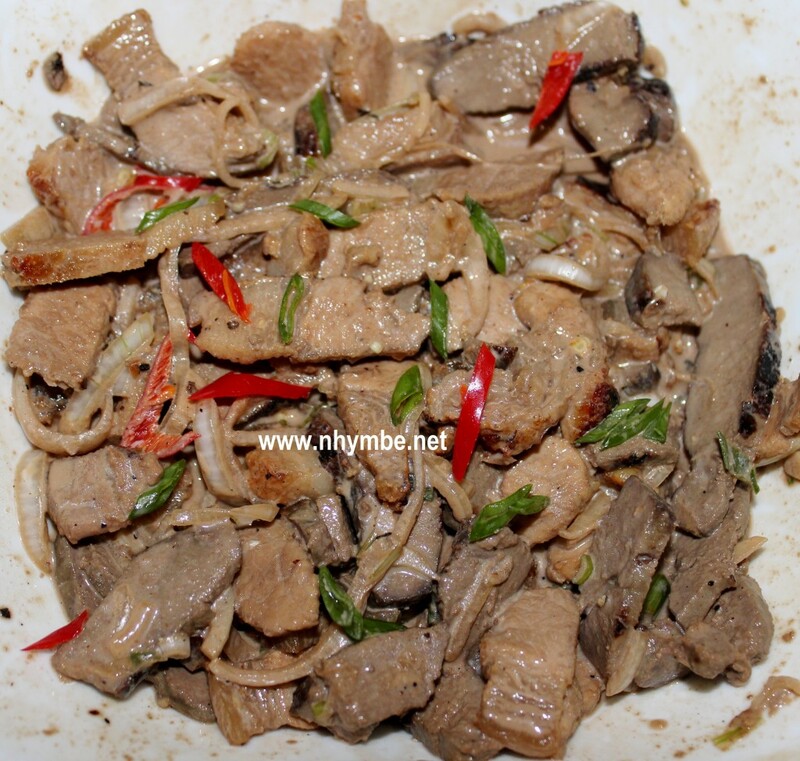 3) Slice the pork meat and liver into thin and rectangular shape. 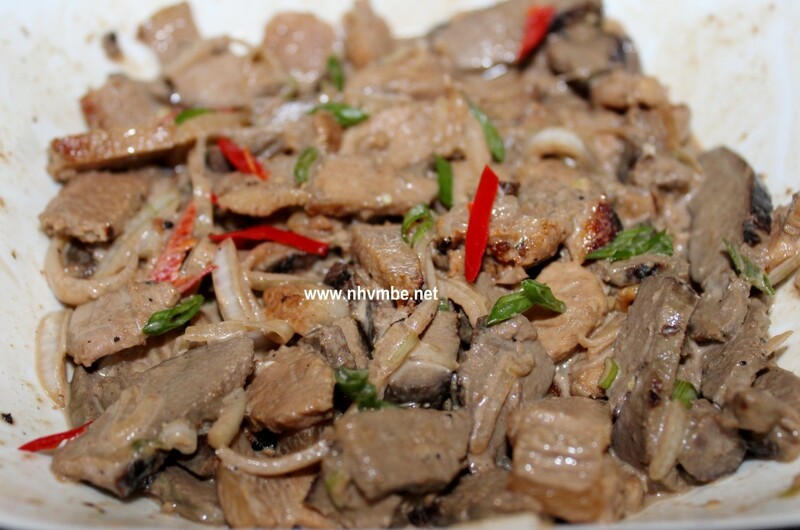 4) Combine the soy sauce, calamansi juice/extract, black pepper, minced onions, mayonnaise, and utak ng baboy to the sliced pork meat and liver. Mix well then garnish it with the onion leaves. there should be a ginger right??? You boil the brain together with the plastic? You can wrap the brain with aluminum foil then steam it. That’s the safest way to do it. And yes, in the province they do that…they put the “utak” inside a plastic (plastic ng ice) tie it then boil it for about 15 minutes. Haha! For how many persons ????? Or for how many servings is that ?????? It depends on how big the appetite of the persons who will eat especially for the typical Ilocano who loves dinengdeng and plenty of rice, this should be good for 2-3 persons. Small appetite, 3-5 persons. Nagimasen! Never tried this with liempo before. Naimas met no adda bawangna. Thanks for sharing — Very nice pictures!